We got a taste of the Lamborghini Centenario yesterday, and now the car, introduced by Lamborghini at the Geneva Auto Show on Tuesday, is official. Only 40 models of the Centenario were made, including 20 coupes and 20 roadsters, and all already have buyers, the company said, with a price tag of about $1.9 million a pop. 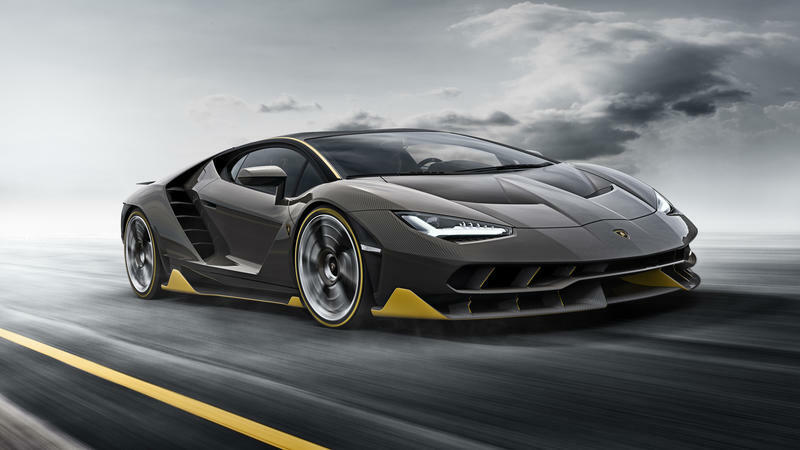 "Using the V12 architecture, the Centenario's naturally aspirated engine produces 770 hp and powers from 0-100 km/h in 2.8 seconds, and from 0-300 km/h in 23.5 seconds with a top speed of more than 350 km/h," Lamborghini explained. "Braking from 100 km/h to standstill is achieved in 30 meters. A monocoque and body in full carbon fiber provide a low weight of 1,520 kg and a weight to power ratio of just 1.97 kg/hp." The car features a carbon fiber body, scissor doors and an aerodynamic design that Lamborghini said it created to mimic a 1970s sports car, complete with working fins on the front and back of the car. Inside, the Centenario features a 10.1-inch touchscreen display with Apple CarPlay support, interior cameras and more. There's even space for two helmets in the trunk. The car is currently on display at the Geneva Auto Show which, it seems, is the closest most consumers will ever get to one.